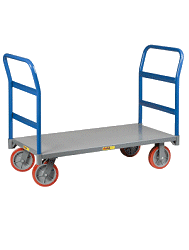 This new electric battery powered appliance cart was designed for easy moving of big appliances over level surfaces. This unit does not have stair climbing capability. It can handle up to 750 lbs on level surfaces and 500 lbs on a 3:1 incline. The turf tires ensure smooth rolling even over rough surfaes such as grass, sidewalks and asphault. It is recommended to keep it charged overnight when not in use, which will give you a full typicals days use, or approximately 2-3 hours of run time. Frame Height -60" In 4 wheel position 51"